A growing paradigm shift is taking hold throughout the country that is once again bringing simplicity to the ways we care for the dead. Flowers lay aside in the forest plot of the Rosendale Plains Cemetery as a green burial grave is closed. Photo by Kristen Warfield. Kate Kalanick was living in Ojai, California in 2011 when her mother passed away unexpectedly. While coping with the shock of the news, she and her sister scrambled to make funeral arrangements. Their mother’s body was picked up and brought to a mortuary to be autopsied. Knowing the toxicity of the chemicals used for embalming, Kalanick was totally set against having it done to her mom. She always tries to do what’s best for the environment … She prefers organic foods, has solar panels on her house, and at the time, even drove an electric car. She wanted to keep her mother’s body in its most natural state, and knew her mom would have wanted the same thing. Besides, whenever Kalanick accompanied her mother to a funeral, her mother would make remarks on how unnatural the embalmed body looked. But as the wait for an autopsy ensued, a problem arose. The coroner pushed Kalanick to have her mother embalmed. She kept refusing, yet the coroner kept insisting. The coroner reluctantly agreed not to embalm, that was, with one stipulation: Kalanick and her sister were told they would no longer be able to host a visitation for their mother. She was deeply bothered with how impersonally she was treated by the professionals there that were supposed to help. At one of the most difficult times, she was not given the options she felt she deserved — and with that, she was set out to do something about it. She began researching the options and rights consumers have while making funeral arrangements. Unknown to her at the time of her mother’s death, a growing number of people were taking death care into their own hands. They knew their rights and options. Kalanick learned that she was never required by law to have her mother embalmed and learned about a national community out there sharing her same concerns with the practice. Even more, she realized there were more options. Kalanick became a passionate advocate for alternative death care, a movement with two main parts: The “green burial” option, which involves no embalming and burial in a biodegradable casket or shroud, and home funerals. Though a home funeral does not always result in a green burial, both practices aim to make handling death more personal. In home funerals, family members and loved ones care for the body and host the funeral at home. Green burials allow the dead to be buried in a more natural setting and biodegrade without chemical or material byproducts. Kalanick was surprised to discover that the Green Burial Council, a nonprofit that educates people about consumer rights and certifies green cemeteries, was headquartered in her hometown. She got involved, and now serves as the council’s executive director. Cemetery staff fill in a green burial grave at the Rosendale Plains Cemetery in Tillson, New York. This cemetery is considered a hybrid burial ground, as it offers both conventional and green burials. Photo by Kristen Warfield. From this, she realized that not everyone knows their options or about alternative funeral practices. Though they aren’t for everyone, she said both green burials and home funerals are challenging the way of death Americans are used to: a pricy, hands-off approach. When it comes to conventional funeral rites, Americans have become the costliest, most resource-dependent customers in the world. The U.S. funeral industry is estimated to earn $20.7 billion per year with over 19,000 funeral homes in the country as of 2015, according to the National Directory of Morticians Redbook. Among the finished caskets and expensive services, however, a growing paradigm shift is taking hold throughout the country that is once again bringing simplicity to the way in which we care for the dead. 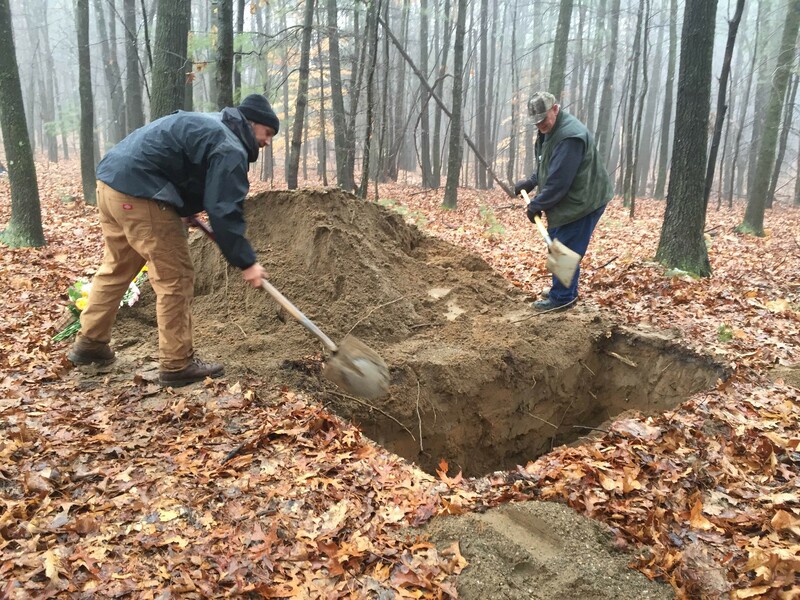 Growing up in a generation where everyone had a traditional burial, the thought of green burials never crossed the mind of Richard Hermance, the director of the Rosendale Plains Cemetery in Tillson, New York. For over 10 years, Hermance has seen countless glossy caskets, vaults and elaborate headstones go into conventional funerals at the cemetery and never knew of any other options available. But after hearing about green burial a few years ago from an episode of “Modern Marvels,” he knew they would be a perfect fit for the small-town cemetery. 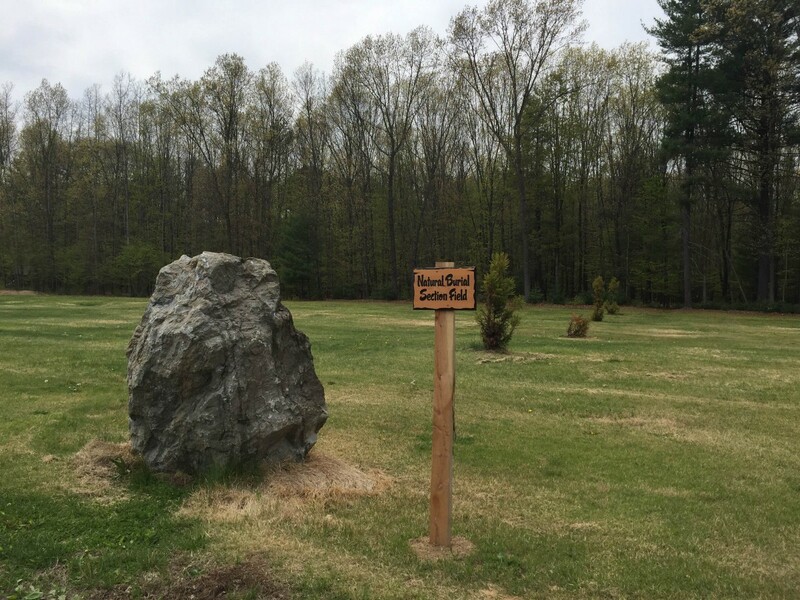 The green burial grounds at the Rosendale Plains Cemetery officially opened in 2014. Photo by Kristen Warfield. Traditionally, burials entail a casket, a vault and a headstone. 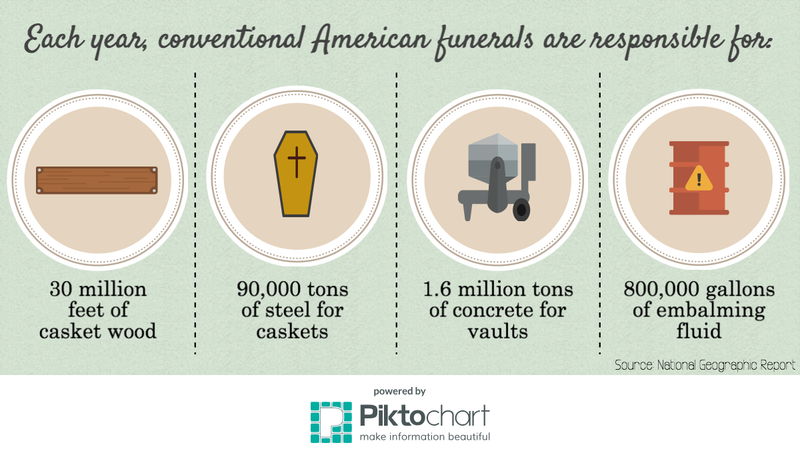 Below the ground, the casket, typically made of metal and finished wood, is laid in a concrete vault covered with a thick concrete lid. In contrast, green burials use shroud or a biodegradable pine or cardboard casket. The dead are lowered into the dirt, where they can naturally decompose. North of New Paltz, the Rosendale Plains Cemetery houses a miniature city of traditional stone monuments and headstones from 123 years of conventional funerals. Its uniform and tidy rows look busy but serene at the same time. A drive through its path sends flashes of countless grey and black stone all around making the graves seem endless. The path ends at a wide-open grassy field with a large boulder at its entrance. Farther back, tall rows of trees loom on for as long as the eye can see. This vast field houses the only green burial grounds in Ulster County, where the dead can be buried in either the open field or in the woods underneath the trees. The forest plot is just 300 feet from the Wallkill-Valley Rail Trail, a popular haven for local bikers and hikers. The green burial section of the cemetery has attracted around 10 plot buyers so far since its inception in 2014, Hermance said, all of which are looking for a simpler way to be memorialized. The green burial field at the Rosendale Plains Cemetery in Tillson, New York. Photo by Kristen Warfield. The first client to sign up was 104-year-old Kesii “Journey Truth” MacKaye of Rosendale. MacKaye, who chose a plot in the field section, said she believes the relationship people have with the planet is sacred, which is why she wants to “give her body back” when she dies. Putting every ounce of life’s energy back into the earth that has provided humans with everything they need, from shelter and food to clothing and more, is MacKaye’s last will to show her appreciation for all earth has done for her. This spiritual connection to the planet lends itself to another driving factor behind why people are going green when they die: green burials are an act of conservation. While most environmentalists make conscious efforts to take care of the earth while alive, the choices they make involving their body after they die also can have a powerful impact, Kalanick said. The primary ingredient in modern embalming fluids is formaldehyde, a substance classified by the International Agency for Research on Cancer as a known human carcinogen, or cancer causing substance. The National Funeral Director’s Association estimates that two million Americans are embalmed each year, translating into a near seven million gallons of formaldehyde deliberately being placed into the soil per year. When someone is buried without being embalmed, the risk of harmful chemicals entering into waterways is eliminated, Kalanick said. Aside from this, the chemicals can enter the atmosphere through cremation. Research from Dr. Ted Chiappelli, an Associate Professor of Health Sciences at Western Carolina University, shows that cremating embalmed remains releases formaldehyde into the air, which can remain for up to 250 hours. Aside from the pollution, embalming chemicals also pose health risks to those who use the chemicals on a regular basis. Research from the National Cancer Institute suggests that long-time exposure to formaldehyde puts embalmers at an increased risk of myeloid leukemia compared to the general population. Embalming serves as a staple of the modern funeral industry in America — the only country where the process is widely used. Despite its popularity, the practice is not legally required in the United States unless the body will be shipped over state lines or overseas. 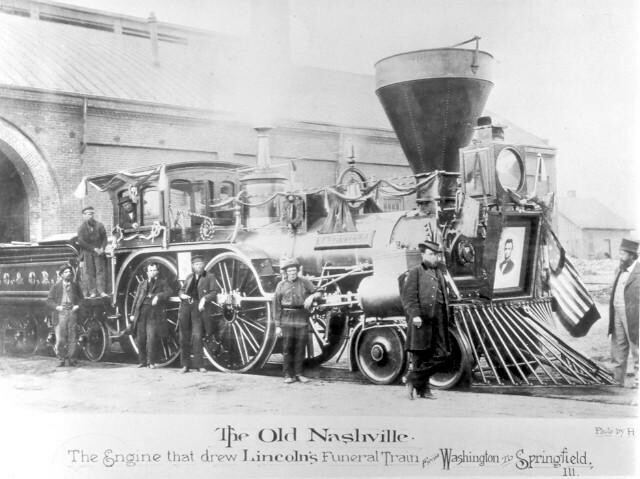 The funeral train that transported President Abraham Lincoln’s body for three weeks following his death on April 14, 1865. Photo Courtesy of Wikimedia. Prior to the 17th Century, most funerals were essentially green. During the American Civil War, embalming rapidly took hold to preserve dead soldiers for delivery back home for their funerals. Dr. Thomas Holmes, a surgeon from New York who had previous experience in embalming procedures, worked for the Union army med corps to train battlefield undertakers in his method of embalming, which used arsenic to keep decomposition at bay. Embalming was new to Americans then; it prolonged the dead’s physical presence on earth like never before. The bodies of public figures, like President Abraham Lincoln, could spend weeks being carted around for mourners to view and pay their respects. But even with this preservation technology, the body eventually loses facial structure and coloring over time. In her book “Mourning Lincoln,” author Martha Hodes tells of how the deceased president’s face became a shock for mourners after being transported around for weeks. Lincoln had been preserved somewhat, but his body’s constant exposure to air and fluctuating temperatures over three weeks showed the public that embalming was not eternal. A child kept at home for his funeral in the 1800s. Photo courtesy of Wikimedia. Before embalming, it was not unusual for funerals to be held right in the home. The family and friends of the dead would prepare the body for viewing and mourners could visit for days at a time. The body was typically kept in the front parlor before being transported in procession to the church and cemetery. But as embalming became more widespread, the dead were passed along to morticians to care for the body, thus sparking the national popularity of funeral homes. When Derek Ormerod and Alicia Toney of Seattle, Washington were expecting their first child, they had no reason to suspect anything other than a healthy baby. On May 24, 2013, their son Burton was born. The newborn was having trouble breathing and was having seizures that caused brain damage so severe that he could not latch onto a bottle or control his eye movement. Burton lounging in his stroller. Photo courtesy of Alicia Toney. 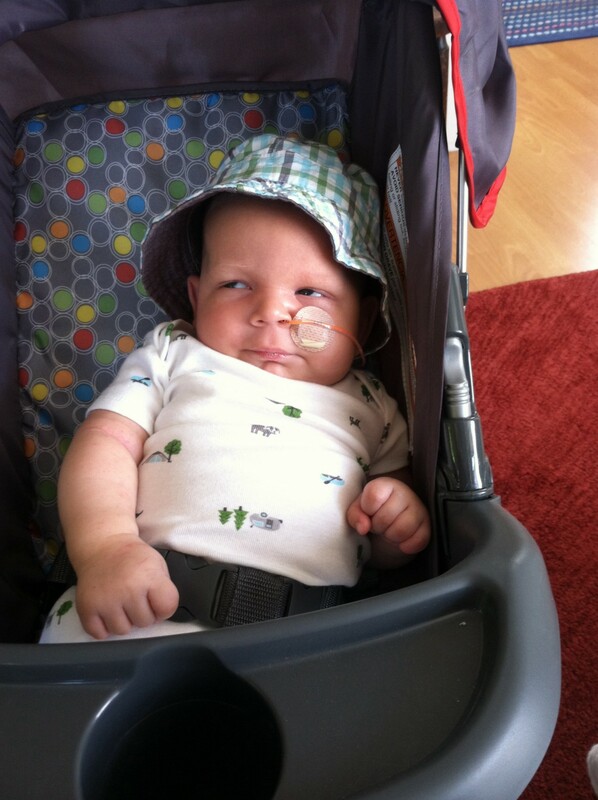 Though a hospice program, Derek and Alicia brought Burton home from the hospital after three weeks. As a few months went by, his condition worsened. Even on multiple seizure control medications, Burton was having nearly 50 seizures a day. Alicia and Derek knew that their son was uncomfortable every day, and that his prognosis was poor. Though doctors could not provide a direct diagnosis after rounds of testing, Burton’s symptoms hinted toward a condition called hypoxic-ischemic encephalopathy, which is brain injury caused by oxygen deprivation to the brain. After being closely connected with a large medical team to consider Burton’s chance for longevity, the couple came to the heart-wrenching decision that they would need to remove their son from life support. Not being part of an organized religion, the couple knew they wanted to find someone to help them through the difficult transition between Burton’s life and his passing. They wanted something beautiful, something personal. By chance, they met Kateyanne Unullisi, a Seattle-based funeral celebrant and home funeral guide. With compassion, care and sensitivity, Kateyanne helped the couple come to terms with what their decision would mean for them and Burton, and which options they had to honor his life. Alicia holds Burton as Derek looks on. 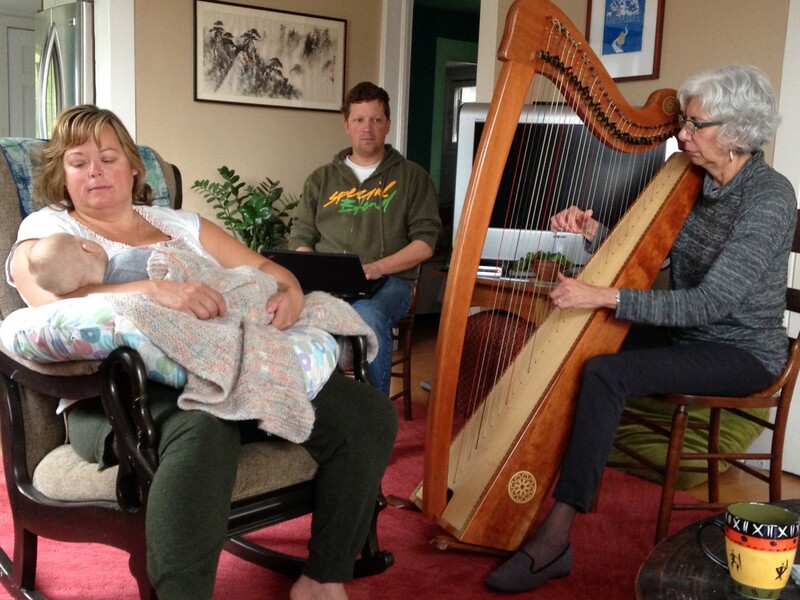 A trained harpist that plays music for those who are dying plays music for the small family. Photo courtesy of Alicia Toney. Aside from the spiritual guidance Kateyanne provided the couple, she also offered up the idea of an alternative way to care for Burton after his passing: having his funeral right at home. At first, Alicia and Derek were not keen on the idea. Their only prior experiences with death had been taken care of by a funeral home and they were unsure about how well they would be able to manage a funeral on their own. Kateyanne explained they would be able to care for Burton at home at the end of his life and spend time with him following his death. The more they thought of it, the more they wanted to do it for their son. On Nov. 2, 2013, at just over 5 months old, baby Burton died. He lay in his father’s arms as he passed, with his mother cuddled up close to them on the couch. They were surrounded by loving family and close friends, and together, the group sang songs to him. The back door of the house was open then, and within a minute of Burton’s death, the group started to hear something. A hoard of geese descended above the house, honking loudly as they passed by on their journey overhead. Looking up in the small window near where they were seated, the group could see them flying off together into the distance. Alicia and some family members gave Burton a bath, rubbed his small body with some oil and changed him into a special pair of pajamas. Derek and Alicia’s father walked down to a nearby park to collect some fallen cedar branches felled by a windstorm earlier that day. They laid the branches around Burton in his crib. His body was preserved only by ice packs. 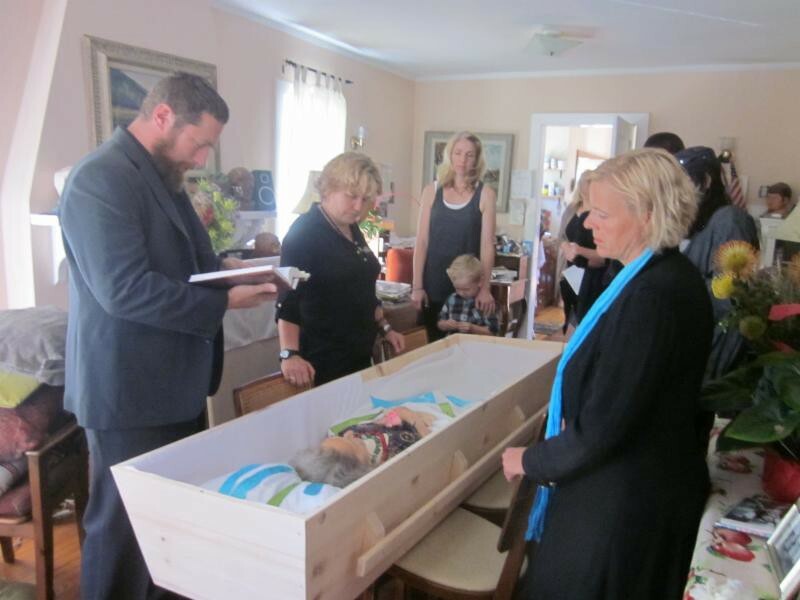 Burton was laid in his crib throughout his home funeral. Family and friends often reached in to touch him or pick him up to hold him. Photo courtesy of Alicia Toney. A funeral director came to file death certificate paperwork, but wasn’t otherwise involved. Alicia and Derek had three days, the legal limit for keeping a body, to spend with their son before they brought him to the crematorium. From this, they had time to reflect on his beautiful but short life and experience the period of grief head on. Lee Webster, the president of the National Home Funeral Alliance, is at the forefront of educating the public about home funerals. Along with many other home funeral guides throughout the nation with the same goals, Webster hosts presentations to people of all walks of life to introduce them to this option. Despite the popularity of conventional methods, home funerals are legal in every state. Lynn Barnett, a Rochester-based home funeral guide, says that home funerals allow for much more personalization than traditional funeral homes. In her experience, it is not unusual to see handmade caskets or children coloring pictures on a biodegradable container for the body. Family and friends often choose to personalize the casket at a home funeral. This photo, which shows decoration of a biodegradable casket, is used in educational presentations about home funerals. Photo courtesy of Olivia Bareham of Sacred Crossings. Webster said a home funeral is still a viable option for people who had an autopsy done, die from traumatic injury, or donate their organs. Once medical professionals know a home funeral will be held, they can take extra care to get bodies back into shape and into the care of the family. 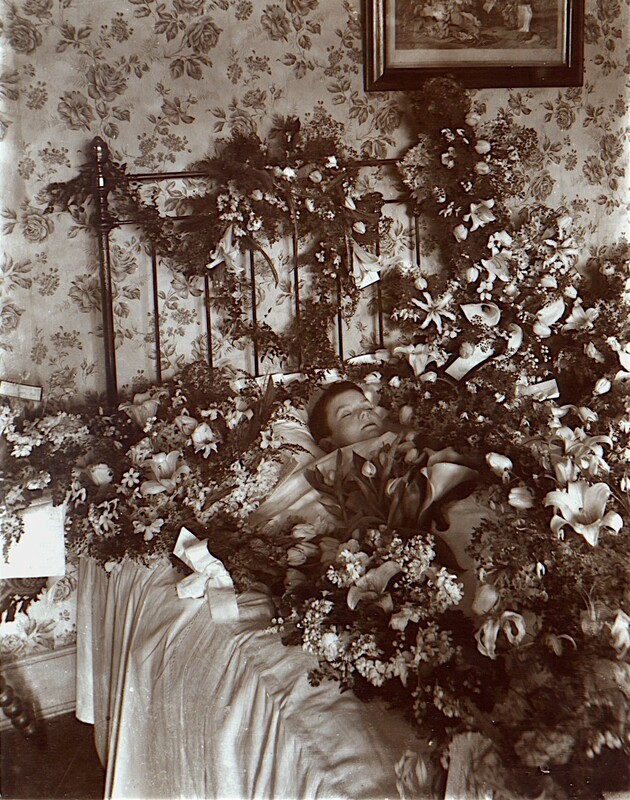 A home funeral photo used in educational presentations on the practice. Photo courtesy of Olivia Bareham of Sacred Crossings. Another one of Webster’s goals is to spread awareness of how Americans can improve their removed relationship with death. For years, she said, movies and television have contributed to a culture of fearing dead bodies. Like Alicia and Derek, Webster believes the home funeral option helps turn this fear into understanding. In the conventional method of body prep, the body is sent to the funeral home. The corpse is cleaned and the blood is drained out and replaced with embalming fluids. Then, the undertaker dresses the corpse and puts heavy makeup on the face, neck and hands to prepare for the viewing. If the body’s eyes are sunken, serrated caps or pieces of cotton are placed under the eyelids. If the mouth won’t stay shut, it is sewn shut. These practices help to make the person look more approachable and more like they did in life — a notion Webster thinks furthers disconnection with death. In her muckraking expose on the funeral industry “The American Way of Death,” author Jessica Mitford criticizes the “memory picture” — a prized and reassuring last view of the deceased that the industry charges people thousands of dollars to perfect. To see their loved one embalmed, rosy-cheeked and slumbering in a shiny open casket with hundreds of dollars worth of flowers heaped around it gives assurance to the grieving that they have surely given their dead a proper send-off. This, Mitford claims, is a driving force behind why the funeral industry is a business. 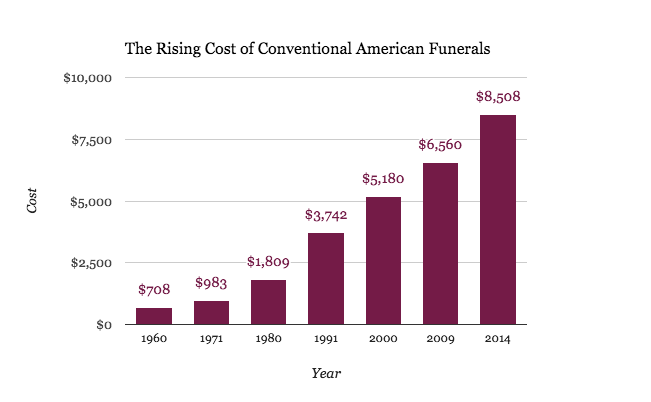 * Data compiled from the National Funeral Director’s Alliance represents the median cost of conventional funerals. According to the National Funeral Director’s Alliance, the median cost of an adult funeral in America has increased 28.6 percent over the past decade. The national average tipped in at $8,508 in 2014. But a home funeral, depending on state, can be as inexpensive as $100, Webster said. 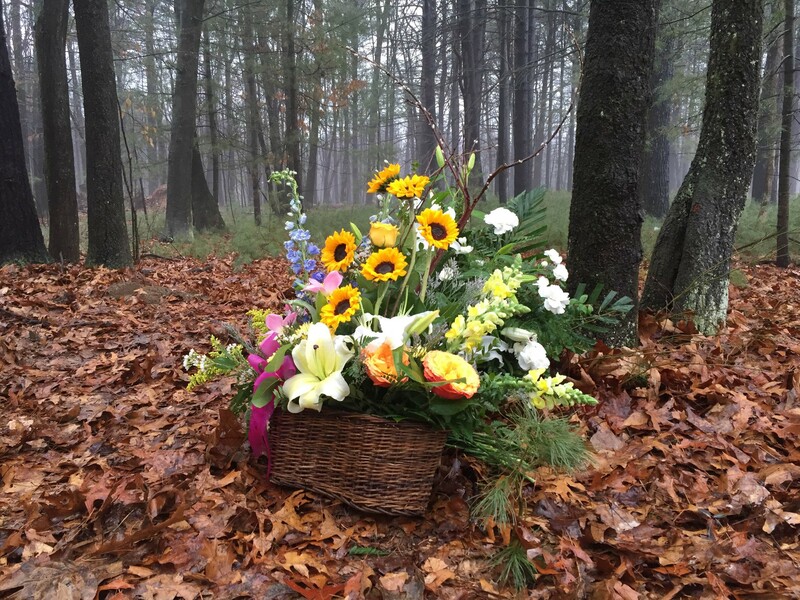 Most home funerals result in a green burial, in which only the plot and a biodegradable container would need to be purchased. At the Rosendale Plains Cemetery, a green burial typically costs around $1,125 plus the cost of a small stone grave marker and any funeral director fees. The day Hermance hosted his first green funeral was rainy and grey, back in mid-February. Hermance said the family opted for a forest plot, not too far from the entrance of the woods, and the grave lay empty until mid-afternoon. This was the first time he would be seeing a green burial first hand. Swarms of cars pulled in, taking over the silent cemetery. Groups walked back in the pouring rain to the gravesite, huddled under the protection of umbrellas and trudging through the wet grass and fallen leaves. Well past the view of the towering stone graves emerged a homemade pine box, a simple casket for the woman that had passed away. Her friends had made it for her, Hermance later learned. The wind whipped, and the raindrops beat down on the service between the branches of the trees above. The small crowd exchanged hugs, leaving red carnations on the top of the casket before it was lowered into the ground. They stood by for some time before leaving. Cemetery superintendent Floyd Craig, and his son Brandon, now had to finish the burial — “closing the grave” they called it. The Craigs had dug the grave with shovels and no machinery, and they would fill it in the same way. The precise and smooth rectangular cut into the earth showed that this wasn’t their first time. The rain continued beating on down the backs of the men, with only one of them wearing gloves in the freezing winter air. Their work boots stayed planted in the ground as they scooped and tossed the dark brown dirt into the grave. “The weight of the dirt will probably crush the casket in no time,” Floyd said, as he steadily dug more dirt onto the small wooden casket. The men were silent and focused on the task that would take up at least the next hour. When the job was done, Floyd still had to stay outside to cover the rest of his mail delivery route. The trees towered over this sleepy little scene, a mere speck unto the vast forest that awaits others to be buried the same way. Despite some lack of national awareness, green burials and home funerals continue to be meaningful options for those looking to make death care a bit more unique and personalized. Across the country, the number of green burial sites are growing, and more people continue to become educated about home funerals through seminars, public lectures and peer support. Both alternative death care options have made strides in veteran programs, educating members of the armed forces that they can opt for these as well. The National Home Funeral Alliance is currently running a “Veteran’s Challenge” effort, that aims to host educational seminars for veterans and their families to learn about natural death care options. 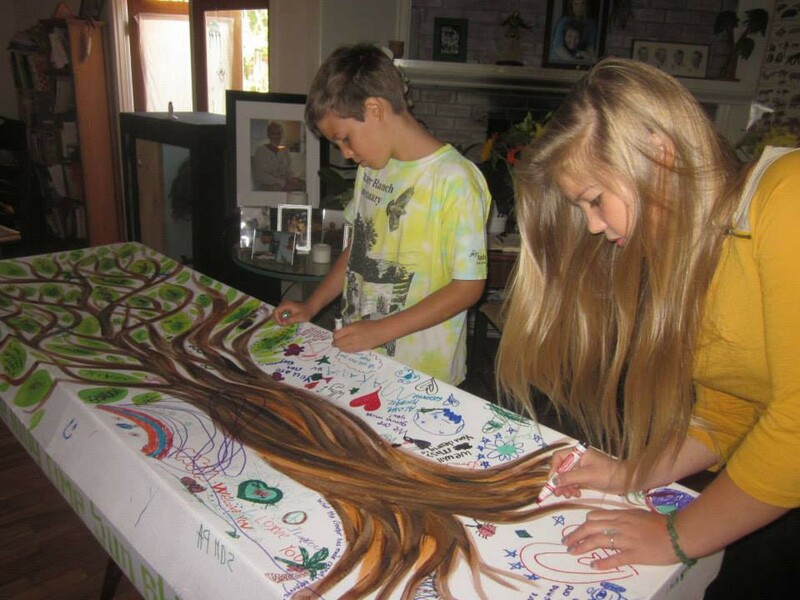 At the California-based Green Burial Council, Kalanick works to inform the public about this end-of-life ritual that can help make the process a bit more meaningful and personal. Harboring the relationship that people have with the world around them makes green burial a unique option for people of all walks of life, Kalanick said, and is slowly helping people come to terms that death is something we must talk about.